Rhassoul clay, also spelt Ghassoul Clay ,is a wonderful, natural clay which has many cosmetic uses for skin and hair. The clay has been mined for over 1400 years from deep within the Atlas mountains of Morocco . 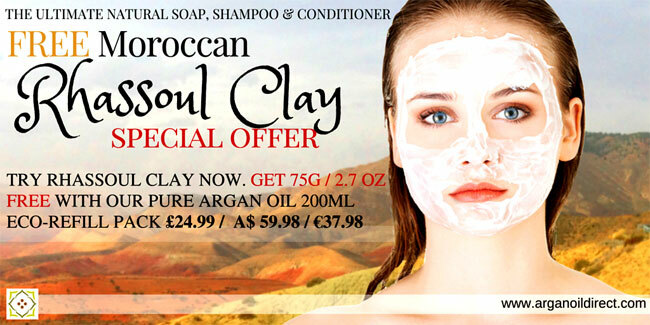 In Morocco Rhassoul Clay is an essential beauty product that every women takes to the Hammam. What is Rhassoul Clay Used for? How to prepare Rhassoul clay for cosmetic use in two steps? 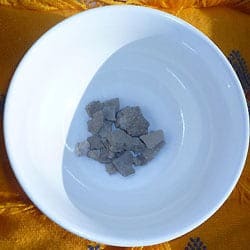 Rhassoul Clay has a reddish brown colour and may be supplied as a powder or small pieces. If you are using raw clay which is supplied as pieces then these can be powdered before preparation and will produce a smoother clay for skin masks. This is not essential. We advise that you mix your clay in an old bowl as the clay is quite abrasive and could damage the surface of your best kitchen crockery! Raw Rhassoul clay has a very long shelf life and can easily be stored for around 4-5 years. Rhassoul Clay paste to use for shampooing, soap or face masks is easy to prepare. Simply place your clay into a bowl and add water. Leave this to stand for about 5 minutes until the clay pieces have dissolved. Once the clay has hydrated it can be stirred so that you get a consistent and rich, fluid paste which will be easy to apply with your fingers. At this point you can add any other ingredients that you wish to make part of your mask or hair treatment. 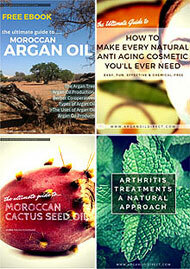 Oils to help condition the hair or skin or treat acne for example. You can make up extra clay paste than you need to store for later. Save time by making up more clay for when you are ready to use it. After preparing the raw clay paste we suggest you put the paste into an air-tight container then cover with a little water and put a piece of “cling-film” or “plastic kitchen wrap” to slow surface drying. How to use extra ingredients for Custom Clay face masks or body wraps. For making a face mask or body wrap we recommend adding around 2 teaspoons ( 10ml) of Cosmetic Moroccan Argan Oil per 10g clay. If you have some pure Cactus Seed Oil to hand then we would also add half a teaspoon of this. Rhassoul clay does not shrink and tighten nearly as much as other clays such as Bentonite clay but adding the oils helps reduces tightening effect and also acts as a skin moisturising treatment. Make your own personalised Shampoo. If preparing your Rhassoul clay for shampooing hair then at this point you may want to try adding a little acidic product to the clay paste, such as Apple Cider Vinegar, or Aloe Vera gel. This will help to neutralise the naturally alkaline clay to bring out your hair’s natural shine. Alternatively rinse your hair with a shine boosting hair infusion after shampooing. Remember that different consistencies of clay paste will be needed depending on what you will be using them for. Make a thicker Rhassoul paste for skin treatments then you can take some of this and add a little water to this to produce a more flowing, liquid clay for hair shampooing and conditioning. Moroccan women have a thicker “wavy” Mediterranean hair type. To help soften and relax hair for styling Rhassoul clay has always been used as a natural hair relaxer. Rhassoul clay is used to Shampoo clean and condition hair so you do not need to shampoo before use. How much clay do I need for a Hair treatment? For hair shampooing and conditioning the amount of clay needed will depend on factors like the length and thickness of your hair. So, you will need to experiment a little to find the right amount for your hair. A typical amount for medium length, thick hair would be 1-2 tablespoons of Rhassoul clay mixed with around the same amount of water. Make the final consistency quite liquid so that it can spread more easily through your hair. How to use Rhassoul Clay for Hair. As noted before pure Rhassoul clay is alkaline. Natural shampooing may leave your hair looking less “shiny” than normal when compared with chemical products. The reason for this is that natural Rhassoul clay has is Alkaline with a “PH” of around 6.5-7.5. This is less acidic than the natural PH value for hair. Some people find that this can lead to a loss of shine. 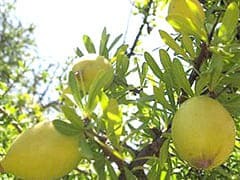 If so, you can try adding a little acidic product to your clay paste – Aloe Vera Gel or Apple Cider Vinegar are recommended – for adjusting the PH balance. You can also add some drops of your favourite essential oils to the Rhassoul Clay paste – Argan, Apricot or Jojoba are ideal. How to make a Shine-boosting natural hair rinse infusion. Instead of neutralising the Alkalinity of the clay paste after shampooing you may choose to bring out your hair’s natural shine with a lightly acidic hair rinse. You can customise your rinse by making a herbal infusion. Do this by steeping herbs in water for which adding some of the many natural herbs that are great for hair conditioning. A Quick Herbal Rinse Method: Put about 1 to 2 large mugs of water in a pan and boil then turn down until water is simmering gently. Next, add around 2 oz / 60g of the herbs of choice and simmer gently for half an hour. Allow the infusion to cool and when cool enough strain into a clean container. Add water to produce enough infusion to cleanse your hair. 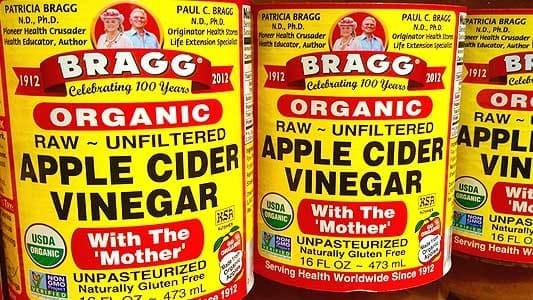 Apple Cider Vinegar Rinse Method: If preferred you can make a simple apple cider vinegar cleansing wash. Take around 2 fl oz/60ml of apple cider vinegar and add three times the amount of water ( around 180ml). You can use for your final glossing treatment after shampooing with your Rhassoul Clay. After hair is clean pour about half of the vinegar/water and leave for 4 minutes then rinse with cold water. Repeat the process then move on to drying and styling. 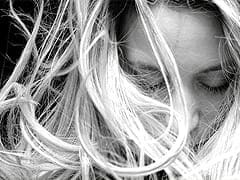 The condition of the scalp is most important thing to consider when trying to beat dandruff and even some sorts of minor hair loss. Chemical products can both dry the skin, leading to more dandruff, and may cause inflammation. This inflammation whether caused by cosmetic products or skin conditions, such as Eczema, can cause hair follicles to shrink or become clogged and leave an unhealthy environment for new hair to regrow. In the end this can result in noticeable hair loss. Rhassoul – a pure, cleansing clay for skin masks and body wraps. How much Rhassoul clay do I use for a face masks? For a single face mask about 10 grams of clay around around 3 teaspoons (15ml) of water should be enough. How do I apply a clay face mask? Prepare your clay so that will be easy to apply with your fingers but not too sticky. Simply, apply with fingers to your face – avoiding the eye areas of course. Clay is a gentle and natural mud so should not cause any great irritation if you do get some in your eye. If you do simply flush out with water. Leave the clay mask to dry for about 15 to 30 minutes and then wash off. The clay can become quite dry so it can be easiest to remove using a hand held shower hear. Rinse first with warm water until the skin is clean and follow up with a cold rinse. In the Hammams of Morocco, after a clay mask treatment we will usually have a anti aging face massage with moisturising Argan oil. Exfoliating and detoxifying with Rhassoul Clay a natural soap, shower gel and body scrub? Rhassoul clay is great from removing oil and grease from the skin as well as unblocking pores. It has a natural, gentle, abrasive texture that also makes a clay paste a great alternative to soaps and shower gels. To try this natural soap, make up your clay paste – probably 20g or more will be needed for a shower. Next, get into your shower and wet your body ready to apply the clay. The best way to wash and apply using the clay is by using an ex-foliating glove. This gives better contact and increases the ex-foliation to clear and renew your skin. After you have massaged and clean with the clay you can begin to wash it off. When used as a soap or shower gel clay does not need to dry. 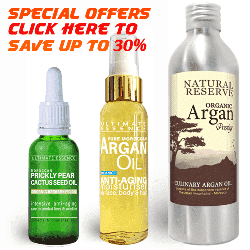 Once clean pat the skin dry and massage the skin with pure Argan Oil or your favourite moisturising product. Is Rhassoul Clay suitable to use for skin problems like Eczema or Psoriasis. The problem is that each skin problem can be different and so may or may not benefits from a clay treatment. Where skin is very damaged for example the abrasive nature of the clay may simply cause extra irritation. When applied to Eczema that was red but with not many cuts or damage the clay seemed to leave skin slightly more red after application. There was also some increased heat. This did fade to leave the skin less red and dryer than before. We would not like to make any recommendations and are of not medically qualified to do so. If after research you feel that a clay treatment may be something to try then we would suggest you always do a patch test first somewhere on a problem area such as you leg or arm. If you are not yet applying an Eczema friendly diet and are still using chemical products for your skin care this may be time to try a more natural option to see if it brings good results.